We are about to buy my daughter a car: she turns seventeen this week so the usual insurance issues apply! She has whittled down her choice between a Fiat 500, Fiat Panda and Citroen C1. There are small-engined versions of each. Has anyone got strong opinions about which she should go for? Hugh "I'm not paying that! I can make one for less than that..."
Usually not a true statement. Hyundai i10 or Kia Picanto! I have 2 friends with Fiat 500s and both really like them. I've driven quite a few hire 500s and Pandas and prefer the 500, even though the sensible choice would probably be the Panda, being pretty much the same car but more practical and cheaper IIRC. I've had both Panda and Citroen C1 (in sister design of a Pug 107). Like both of them TBH. Panda probably the more 'mature' of the two and the C1 a bit more 'yoof cred'. Both cheap-as-chips to run, I'd think the C1 cheapest though. Both can be group 2-3 insurance (on the 50 scale groups), do over 40mpg without thinking and consumables cheap - I changed front discs on a Panda and they cost about £25 ). Can't comment on the Fiat 500 but definitely the 'coolest' of those one's and same platform as the Panda I think (certainly shared with Ford on last gen Ka). Don't think any are bad cars at all so for me all boils down to 'best deal' or which is the one your daughter would choose herself if all similar? Bought my daughter a Fiat 500 Lounge. Brilliant car that is really easy to drive and is surprisingly roomy and well packaged. SWMBO loved it so much she also bought one. That would impact your choice wouldn't it!!!! That's off the list then. "I'm not paying that! I can make one for less than that..."
Narpy junior just bought himself a new Renault Clio and he's very pleased with it. 1.0 litre, alloy wheels etc. And insurance was under £1k. Be aware though he is 22 and that could be a huge difference on 17-21 age group. Future dil bought a Fiat 500 just over a year ago, 14 plate and loves it. Been out with her in a couple of times, quite liked it to be honest, even the boss liked it, that saying something. Two issues, first one is quite common I believe, speedo reading very slow, your doing about 50 but it reads 20, replaced under warranty, passenger airbag fault, £108 to repair last week. 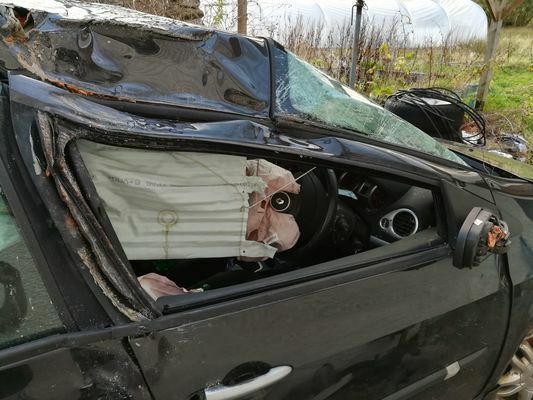 Having had what could have been a very different result without curtain airbags, I got our 19yo another Clio, with curtain airbags. Thanks - some very useful info there "I'm not paying that! I can make one for less than that..."
I had a Fiat 500 for bombing around town in. A great little car only let down by noise on the motorway and no air conditioning. Mine was a basic 1.2 pop. Swapped it for a JCW. My nieces both got a Fiat 500 for Christmas 2017 and they love the look of them, but the eldest goes to uni in Birmingham and doesn't like motorway driving in it at all. Both the cars have been back and forward to the dealer with loads of little problems like electrical gremlins, bits of trim falling off and strangely both of them had the o/s/f/ door handles come loose but nothing major. We have just bought a C1 on a 62 plate: 7,200 miles and six main-dealer services in the book. It still has the 'new car' smell.